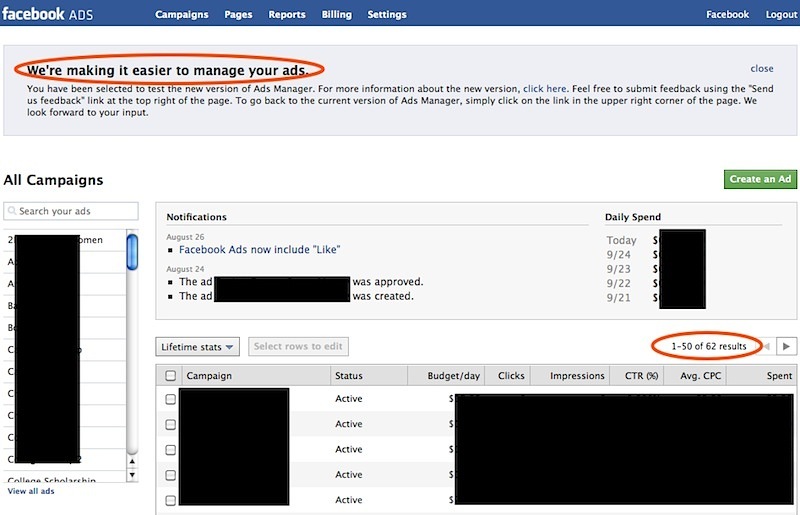 Facebook recently redesigned its Ads Manager, and sent out invites to select users to try it out. I saw the notification at the top of my account on Friday and have been playing around with it over the weekend. Not a whole lot has changed, but it’s definitely easier to monitor your campaigns, both expired and active. What they’ve done is put all of your campaigns on the front page of the Ads Manager and from the looks of things, increased the page width as well. Facebook has also listed all of your previous campaigns by name on the left of the page with a scroll bar to sift through them. Here’s what it looks like below (pardon the blacked out areas, but I can’t reveal ALL my secrets). It’s not known when this new Ad Manager will completely roll out for all advertisers, but I guess they’re starting with a select few. One of my accounts has been active for a few years now and thus saw the notification. My other account — which is only a few months old — did not receive the notification to try it out. I’m assuming they are letting the members with seniority be the beta testers, sort of like with Facebook Lite. Speaking of changes, Facebook recently started sending out notification e-mails whenever they bill your account. Some advertisers were complaining that it was too hard to keep track of their billing and didn’t know when Facebook would charge their credit card. This confusion led to many disputed bills and chargebacks, which ultimately was a huge headache for Facebook. Overall, it’s nice to see Facebook tweak itself and keep pushing forward. Now if they’d only remove the subject line field from messages and let Twitter handle the ‘mentions’ in status updates, I think they’d be top notch. It definitely has become easier & more valuable tool. Sure, it’s a great road ahead with few right decisions from them. Let us all hope it does fall that way.